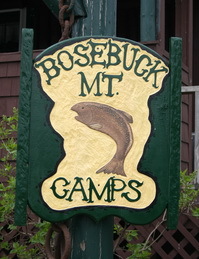 Bosebuck Mountain Camps is a traditional sporting lodge located in the remote unspoiled wilderness of Maine’s western mountains. Situated at the northern end of Aziscohos Lake, we have been providing quality hunting and fishing experiences for nearly 100 years. We offer comfortable lodging in our rustic lake front cabins as well as hearty home cooked meals. Bosebuck’s unique setting makes it a great destination for those who enjoy outdoor activity or just plain relaxing. This is also a perfect destination for retreats, reunions and family vacations. The lodge and cabins offer private, exclusive waters and some of the best fly fishing opportunities in Maine for wild brook trout and landlocked salmon. If you get up early, you are likely to see a moose or a deer wandering through camp or swimming across the lake. The loons, eagles and many other birds can be seen right from your porch and the songs of the loons will put you to sleep at night. Whether you’re motoring around by car or boat, at dusk or dawn, you’ll almost always see a variety of wildlife. Approaching quietly, in one of our canoes or kayaks, you’re likely to see even more creatures. Hunting, Fishing, Snowmobiling, or just Enjoying Nature with the Family!